“@wits: "Audience drinkin' whiskey, guest drinkin' Red Bull." - @johnmoe at #wits” with fabulous DJ @JakeRudh who loves to ad lib! Nice promotion @mikefotis from barter to actor at #wits! #wits @winnerbowzer looking very kicky tonight! 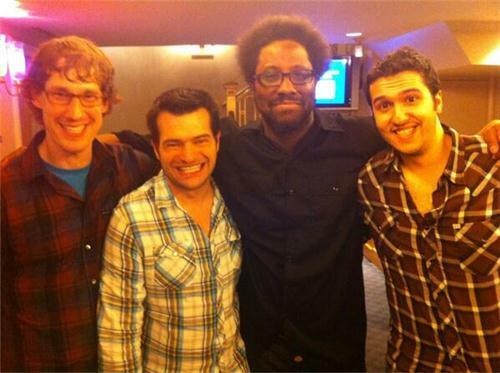 Both @wkamaubell and @mikefotis at #wits?!? And a guy in a real Zurah Shrine ceremonial jacket - I don't deserve this. Hawt #wits date night wraps up with a stop at lund's, then driving sitter home. what's next? Laundry? Woot! Hey #wits fans: @bnacker wrote that amazing Peanuts sketch, @MattGourley wrote that amazing Statue of Liberty sketch. Proud to know them. Lovely evening with @ramoss and the gang. #wits wins every time! Great to see @irishgirl & @TWEAK post #wits, if only for a moment! #wits is full of strange moments. Like showing @_BrendanBenson a picture of a deinonychus backstage so he'd understand his character.